Whether this is your first date together or your 50th, going on a date can be exciting and allows you to spend quality time together. However, if you've grown tired of the ordinary dinner and a movie date, it's not the only date option out there. There are many alternatives to the old stand-by; the key is to find an activity or outing that interests both of you. It doesn't have to be the same old thing each time you go out. As a matter of fact, doing new things can help you get to know each other better and bring you closer together, even if you've been together for years. 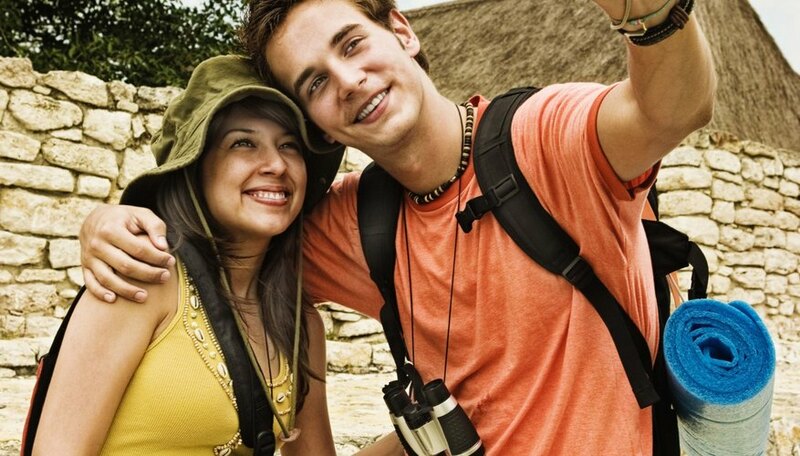 Go on a photo scavenger hunt together -- take pictures in front of your favorite sites. Sports-themed dates let you spend time together doing something active, yet they don't have to be strenuous or require athletic abilities. Hit the golf course for a round of golf, even if it's mini golf or hitting balls at the driving range. Other sporting activities to try out on a date include bowling, go-karts, ice skating and roller skating. If you are a more athletic couple, try tennis, rock climbing or racquetball. Almost every city has tourist attractions nearby. For your next date, head to a local museum, national monument, art gallery, seaport or anywhere tourists would go in your city. Act like tourists for the afternoon, taking in the sights and enjoying the local culture. If available, hop on a tour bus and take a guided tour of the city. Zoos, public gardens, vineyards and historical sites are other places for sightseeing. Taking a class together is a non-traditional date idea. Sign up for a class to improve upon an interest you share together, or explore something new together by taking a class in something neither of you have any experience. If you're newly dating, try a one-night workshop to avoid lengthy commitments, but If dating for a while, enroll in classes that run for a few weeks. Classes that couples can take together include cooking, massage, foreign language and dance lessons. If you love to spend time outside, grab your roller blades or your bikes and head to the local park. Take a hike, or go for a long walk on pre-designated hiking or walking trails. For a more relaxing outdoor date, grab a blanket and some board games, or a deck of cards, and find a quiet outdoor location to lay out a blanket and play games. Plan the date for the early evening so that you can watch the sunset or attend a free concert in the park and dance under the stars. Enjoy an evening on the town that doesn't start until after dinner. For example, you can take in a live show or a concert or visit a comedy club. Nightclubs and dance clubs are other venues that typically peak after dinner time. You can try you luck at a casino or take a midnight stroll along a nearby beach. Bring along a music player and CDs and now you have your own private dance club on the sand. Ellen, Mary. "Date Ideas That Don't Involve Dinner & a Movie." Dating Tips - Match.com, https://datingtips.match.com/date-ideas-dont-involve-dinner-movie-13196878.html. Accessed 22 April 2019.